Not everyone who writes for a career has a writing degree. It’s common to see the letters MFA, for Master of Fine Arts, behind a name of an instructor or an accomplished writer. But there’s another degree — really a set of practices and studies — that delivers compelling writing. 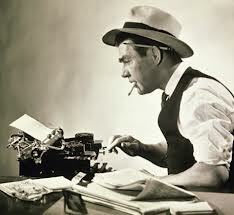 Bloggers, who tell stories all the time in great numbers, are starting to rely on the skills of a degreed journalist. The thinking is that journalism, as practiced by a professional with experience, gives you a great storytelling voice. The reporter’s. Over on the Write to Done website, a handful of tips help writers become better earners while practicing their craft. Once you go beyond the joy of writing for the experience of creation — what I call The Writing Life — you can graduate to a Writing Career. You don’t have to pursue a career, of course. Becoming a writer who earns a living with their storytelling is the entry to a Writing Career. #1. Draw them in with story. Many writers feel their job is to merely convey information, and so that’s what most of us do: We put numbered lists and ultimate guides on our blogs, or enumerate the benefits of our copywriting clients’ products in a brochure — and then sit back and wait for the accolades to roll in. Oops. The fact is, no matter what kind of writing you do, your job is to connect with readers by telling stories. Sure, those stories will convey information, but they will also help readers understand your info emotionally as well as logically. Pick up any women’s health magazine and you’ll see articles that lead off with an anecdote about a woman who survived a dread disease. Scan through a business publication and you’ll notice stories of entrepreneurs who increased their profits through the downturn, or hired homeless people, or succeeded despite going up against big box stores. Parenting articles are rife with anecdotes from real moms. You can use the same technique in your web pages, blogs, and books. Instead of listing your client’s amazing qualities in a brochure, tell a story about how their product improved someone’s life. Rather than writing “just the facts, ma’am” in your book or blog post about time management tactics, weave a story about a hopeless case who turned his life around by learning to manage his time. Using storytelling techniques like journalists do will not just teach your readers, but make them care about what they’re learning. The idea of making someone care about your writing is important. It gives your stories emotional weight, heft, and leaves the reader sticking to what’s being told. The journalist’s craft — really, an art considering how few words we get to use — can be supplemented by extended work in setting, and in dialogue. Most journalism doesn’t build scene as extensively as fiction, or creative non-fiction. But the exemplary writing does. It’s the kind that can sell an app, or make a reader cry. Journalists have something call a nut-graf, the paragraph in the story early on that lets the reader know “why should I care?” Journalists set the stakes early in their brief stories. Early stakes is an essential part of good storytelling. You can read a lot of literature where the stakes are hidden, or not even considered, in lieu of the beauty of the language. Beauty is essential, but not at the expense of story — if your writing will be memorable. Memories make up memoirs, and that’s another place where storytelling becomes essential. A mid-grade memoir, one that won’t find a wide readership, is going to be bogged down by too many details and too little emotion. It takes the structure of a story, illustrated by memorable places and lively scenes and drama, to make an exemplary one. Good journalism is easy to find in places like the website longreads.com. Any writer who wants their prose to sparkle needs to bring details to the picture. A favorite article from my files points out that seeing without judging, objectivity, is just the sort of thing you can refine and practice from working in journalism. I started in journalism. I’ve written nonfiction for more than 35 years, beginning with small town papers. I learned to stay detached from judging while I was telling a story’s details. Journalism just observes. The practice helped me see to picture things and places clearly. That favorite article comes from my deep files, a 29-year-old issue of the The Writer. Russell Working, the youngest winner of the Iowa Short Fiction Award, was once a reporter on a daily paper. Storytelling demands detail. The image, not the idea, is supreme. Great writers have the ability to focus their powers of observation, and to describe the images that contribute symbolically or aesthetically to the whole of their work. Working goes on to cite details in Hemingway’s classic story A Clean, Well-Lighted Place. Hemingway cut his teeth on journalism. Working’s article praises this practice of detachment. Such writing requires a kind of objectivity, an ability to detach yourself from your subject and simply observe. Writers are sometimes content to slog about in abstractions on character, rather than offering telling detail. Working has published plenty of nonfiction, but he’s crafting short stories. Check out the beginning of his story “The Irish Martyr”. It’s part of his collection that won the Richard Sullivan Prize for Short Fiction.